Our plane hits the tarmac at Fort Lauderdale, Florida. We are back in the first world, home from the fourth world. Where is the fourth world? For me, the fourth world is a place which may have been third world or even second but has been devastated by the forces of a natural disaster and/or has been reduced to socioeconomic ruin by long standing corruption and internal and external greed. 90 minutes by air away. Driving home from the airport, we cover the 50 miles in 40 minutes on the smooth freeway. I stare out the window at the big cars, the well- constructed buildings, groomed fields. By contrast the ride to the airport in Port au Prince, Haiti, takes over an hour and was around 10 miles. Broken road, broken down cars and trucks, broken homes and broken lives. But not always broken spirits. Beautifully dressed children busy markets, people in survival mode, stunning art works hang for sale, beautiful music coming from groups of clustered musicians. The air is thick with dust, almost everywhere there is rubble and piled rubbish, seemingly oblivious to it children kick plastic bottles, play, most are helping in the markets, sweeping, sitting with older folks, a few lucky ones walk to school in pressed uniforms. The wet season is coming, drains are blocked and there is going to be flooding. UN troops are scattered thinly on the ground, many tent villages are subject to crime and sanitation is non- existent. What can Haitian children expect from their lives? 100,000 were orphaned by the quake and thousands more subsequently by disease like cholera. A public health disaster continues to unfold there. 20,000 of these orphaned children are fortunate enough to shelter in orphanages that have set up around Haiti, some have sheltered with other families and some fend for themselves, as young as four or five years old. 5% of children receive education. We have spent the week seeing patients and operating at the Adventist Hospital. We are hosted in Haiti by Dr Terry Dietrich, orthopaedic surgeon, US trained, and his wife Jeannie, a couple who have, through their faith and their training, dedicated time late in their careers, helping in Haiti. 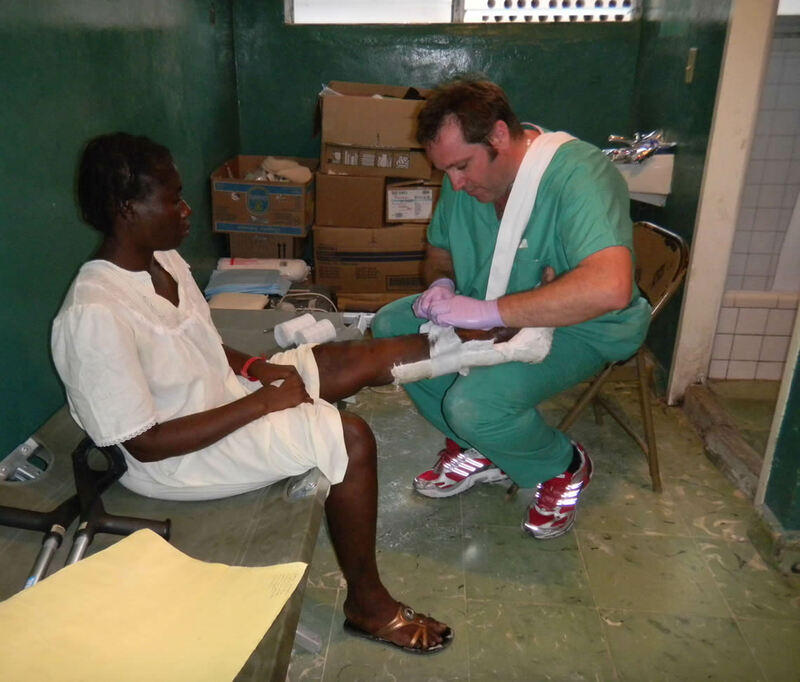 We are joined by Dr Scott Nelson, orthopaedic surgeon, from California, who has chosen to devote a considerable part of his time practising in this country and in adjacent Dominican Republic. Helping him is his current resident Ben Chen. 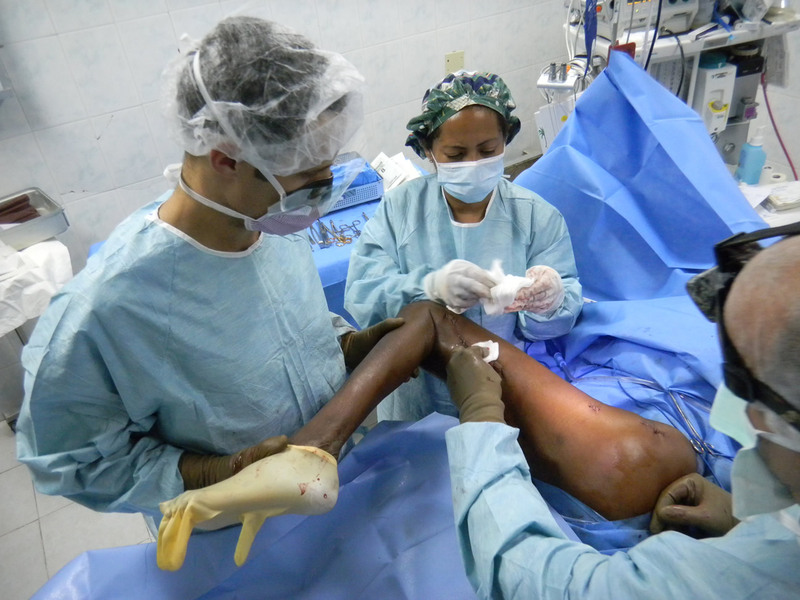 Our surgical goals this week have been primarily aimed at children and young adults with severe limb deformities. Conditions such as untreated club feet, a case of congenital pseudoarthrosis of the tibia, Blount’s disease where children’s lower limbs gradually become more bowed, fractures that have not healed or have healed in a deformed position, Rickets, an osteo-dystrophy often secondary to Vitamin D deficiency that for several children has left them with severe lower limb angular deformities. Anaesthesiologist Ann-Maries James from St Mary’s and visiting anaesthesiologists from central California, Steve Mulder and from the Dominican Republic, Dr. Adrien. We have experienced and invaluable equipment and intraoperative support from Smith and Nephew’s Tom Davis and Jeff Reeve from Orthofix. We have photographic, documentary and logistical support from Aviva Paley, daughter of Dr Paley. This was our team, we are supported by many Haitian and visiting foreign staff of the hospital and the hotel. I am very thankful for their huge efforts. I will document our surgical cases in another forum, needless to say that this was a phenomenally challenging and educational week. A truly rewarding time in our medical careers. At the conclusion of our final surgery, I return one last time to our patients to check on them and to say farewell. I am embraced on the ward by old folk who are grateful for our visit. Children who faced already a difficult life made near impossible by debilitating deformities lay recovering from their surgeries, starting to manage a smile again. I wonder if Haiti can get back on its feet again? If the spirit of these children is any sort of gauge, then yes it can. But it is going to take a much greater commitment. I know that on their own they cannot. Our work is a mere drop in the bucket. Teams need to return here, again and again .Dr Paley is committed to do this and with the recent establishment of the Paley Foundation this is now a very real probability. Haiti needs anyone. They need skilled labour and unskilled labour. They need teachers, mechanics, plumbers, electricians. There is so much that anyone can do here and there are agencies and avenues in place for people to help. Most of all, Haiti, the fourth world, an hour and a half way, needs the people of the first world to think of them and do something, no matter how small, to lift them back up. I am now sitting on our AA flight back from Port au Prince reflecting on the past few days events. Yesterday after two very successful surgeries on the patients mentioned in my last entry, we departed to meet with the Haitian orthopedic community. The one hour car trip to travel 12 miles took two and a half hours in the back of a Tap Tap (a truck with two parallel benches and open at the back). The tap-taps are a not to miss Haitian experience. As the car moved slower than the speed of walking, with start stop jerking through traffic congested, carbon monoxide fume filled, pothole ridden roads we were able to observe PauP during rush hour at the pace of Haitian life. The entire city seemed to be along the sides of the road, oblivious to the mayhem of the slowly moving cars. The sides of the roads are strewn with garbage, frequent open garbage filled canals (maybe sewers) with filthy water interrupted the broken sidewalks. The city is very hilly and we climbed much of the time heading into Pleasantville an affluent part of town. The ride albeit taxing gave us a view of Haitian life across the socio-economic terrain of the city. To my surprise over 25 Haitian orthopedic surgeons showed up to hear me lecture. While some of them speak English all of them are fluent in French. I therefore gave my lecture in French for the next hour and a half. They do not get much continuing medical education from abroad and they were very grateful to have this unexpected visit. I had the opportunity not only to answer many questions but also to find out about orthopedic surgery and training in Haiti. There is one residency program at the University Hospital. This has been severely disrupted by the earthquake. There was one third year resident present at my lecture. They were very excited at my offer to do further teaching on a regular basis when I return later this year. They especially are interested in learning reconstructive external fixation methods and techniques for correction of deformities. 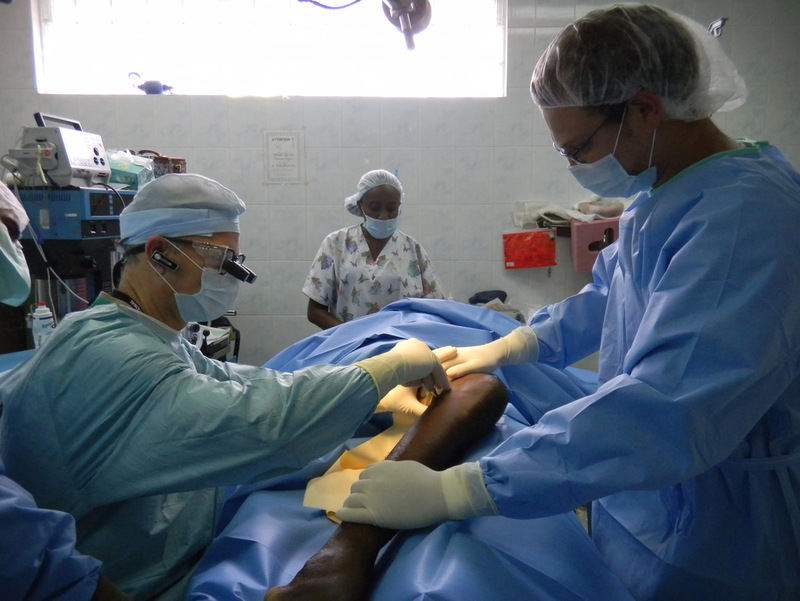 As many of you know I have set up a 501c3 non profit foundation (The Paley Foundation) for the purpose of sponsoring such mission trips as well as for teaching methods of limb reconstruction and preservation to surgeons from around the world. 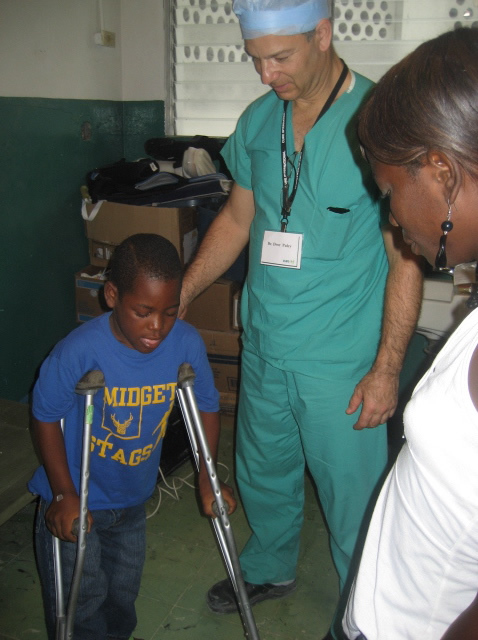 Our trip to Haiti changed from just being a mission to directly help a few children to the opportunity now to help a much larger cross section of the population indirectly through the hands of the local orthopedic surgeons. Basically the concept of if you give a man a fish you feed a family. If teach a man to fish you feed a village. 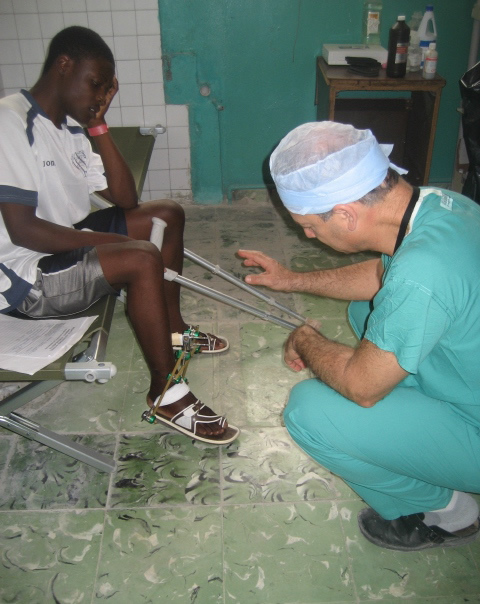 The contact with the Haitian orthopedic community which was organized by Dr. Terry Deitrich, our host, was completely unexpected and unplanned. The attendance of about half of the countries orthopedic surgeons at this first meeting and the positive response by this group for future meetings has expanded the Paley Foundation mission to Haiti into the realm of teaching. I have long known that as a single surgeon my ability to treat patients is limited by my time. 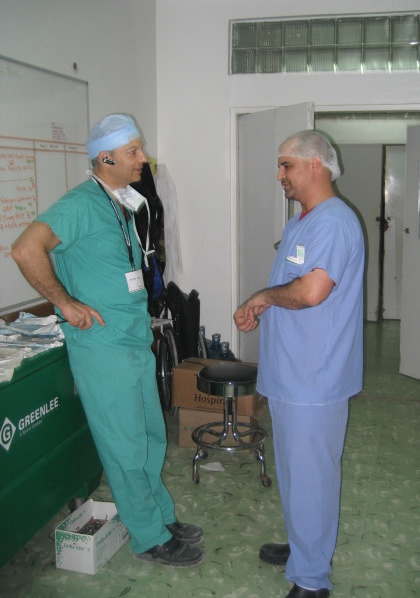 I personally operate on about 700 patients a year between my practice at home and my work abroad. When I teach surgeons at home and abroad I extend that impact to many patients I will never meet and who will never know that I have indirectly touched their lives through the hands of my disciples. I return home knowing that this first mission trip funded by the Paley Foundation was successful at both the direct and indirect impact on patient lives in Haiti. What about the future. Haiti is a mess. This Sunday is the final runoff election for the new President. After the earthquake, the government and its various offices ceased to function. Many of the government buildings and records were lost. The United Nations has stepped in to maintain order and prevent anarchy. The tent cities remain the homes of nearly a million people. Cholera epidemics have replaced falling buildings as the largest cause of mass population death and Illness. Only 10% of the rubble from the fallen houses have been removed. Reconstruction is sparse and cannot occur if the rubble is not removed. Millions of dollars of aid committed to a year ago are held in escrow until there is a reliable non corrupt government capable of dispersing this aid to the reconstruction of Haiti. Predictions that it will take 20 years until the evidence of the earthquake is no longer seen. 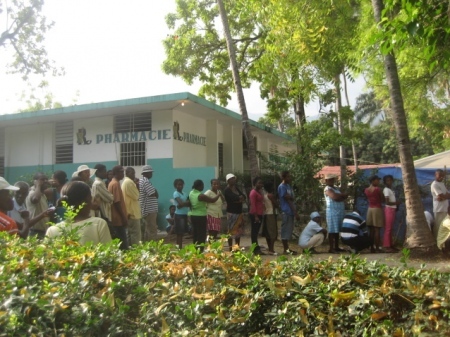 What hope is there for this generation of Haitians? It is likely that they will never benefit from the international aid. Haiti, the second democracy in the Americas, the first independent predominantly African origin country in the Americas, and once the richest sugar producing colony of the Americas is now the poorest nation in the Americas. As I wrote last year much of the fault for this rests in the hands of the old colonial powers (France and United States) who forced Haiti to pay a debt it could never afford for over 100 years. It is therefore the responsibility of these nations to invest in Haiti and help the next generation of Haitians leave their subsistence existence and become self sufficient and prosperous. Despite all of this Haitians are a proud people, with the most beautiful sincere smiles. Why is it the people with the least, seem so happy. Perhaps its their Buddhist no expectations so no disappointments philosophy of life. Perhaps that’s my problem in that I have greater expectations for these people and therefore I am disappointed. I will end this second journey to Haiti with my commitment to return. Dr. Deitrich who is staying till November is keen for me to return for several short 3 day surgery junkets during the rest of his tenure. I am committed to doing so. I live only an hour and a half flight away and hope to return for long weekend visits to do surgery at the Adventist Hospital. In the meanwhile Dr. Deitrich is putting together a surgery waiting list for my return visits. 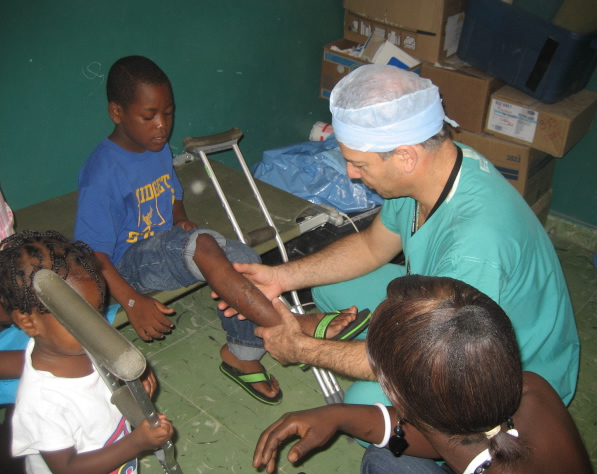 I hope to combine this with seminars for the Haitian orthopedic community each time. I am grateful to Terry and Jeannie Deitrich, the Hopital Adventiste staff for their help in organizing our trip, to the incredible team that came with that donated their time to share in this mission. And to everyone who continues to support the Paley Foundation, it is through your commitment to saving limbs and improving lives that this trip was possible. While my experience here in Haiti has changed greatly since our visit last year, it is still equally rewarding. To my father’s chagrin, I have no interest in medicine, however, volunteering here at the hospital for the past two years has been a fantastic experience. It has taught me the value of community service and the incredible possibilities that can occur when people of many walks of life come together to make the lives of a number of individuals significantly better. Having no medical expertise whatsoever and volunteering in a hospital, I have to be resourceful and a jack of all trades in order to make myself helpful in whatever way I can. In these past few days I have been working to help the doctors in any means I am able, so that they can do their jobs more easily and efficiently, be it organizing supplies, photographing, or running errands. Additionally, Dr. Dietrich has called upon me to help him with a book he is writing to help raise funds for the hospital. This book, entitled “Together We Move: a Collection of Amazing First-Hand Accounts from Haiti Adventist Hospital”, is a visual journey of those who responded to a monumental need for medical aid and volunteer support after the earthquake disaster that shattered homes, lives, and bones. The purpose of this book is not only to tell this captivating story, but to establish and significantly grow the Haiti Indigent Patient Fund that will help Haiti Adventist Hospital cover the ongoing costs of helping those who have very little to give. I have contributed with several articles and pictures to be included in the book. They are looking for donations which will be reciprocated with a copy of the book. Visit http://www.haititogetherwemove.com for more information. Yesterday, I had the opportunity to visit two orphanages, at which I was able to give out small arts and crafts supplies and toys. The state of these orphanages was devastating to see, each housing an excess of children for what their limited resources could supply. While I revel at the opportunity to bring smiles, albeit brief, to these children’s faces, it is clear that the help they need is extensive, not only an influx of resources, but a sustained oversight to make sure these resources are reaching their desired destination. Help is just recently underway for both of these two orphanages, with non-for-profit organizations hoping to sponsor them and improve their situations with a sustainable approach. These improvements are slow and encumbered, however, by a lack of infrastructure necessary to create lasting change. This morning I joined Joseph McIntosh, a volunteer who is in the process of creating food programs at schools which provide children with daily nutritional meals. The school asks each child for one Haitian dollar a day, the equivalent of eight US cents, which, in addition to people’s donation’s, allows the school to save money for other necessary supplies. By attaining a small fee from students each day they can hopefully become self sufficient and replenish their own funds for food. After visiting one of these schools where children were being served food, we went shopping to buy supplies for the upcoming week. With 80 US dollars we were able to buy enough food for 120 students for at least a week and a half. I find it outstanding how far money can go here, and put to the right use, how much it can do. At home my weekly grocery bill is over $80, and to think that here it feeds an entire school! Joseph distributes the food himself to the school, ensuring that the help and resources are going to where they are needed. This was certainly the best eighty dollars I’ve ever spent in my life. While so many all over the world give generous donations, it is often impossible to ensure that the money is reaching the right hands. So often here in Haiti, donation are made by other countries, and then corrupt government officials turn around and sell these goods instead of distributing them. This experience was so rewarding because I saw before my own eyes the direct effects of my donation. The many volunteers of all walks of life that I have met in my two visits to Haiti are fascinating individuals with incredible approaches to helping the people of Haiti in any way they can. I have not written personally to the blog for two days. Sunday we worked till midnight, got to the hotel and ate dinner at 1AM. The day was filled with extreme surgery. Correction of a Blount’s disease case with such severe bowlegs that made walking very slow and challenging. We also corrected another case of such severe knock knees that similarly the child was very limited in activities. Even in my practice in the US where I see patients from all over the world with very severe deformities it is rare for me to see such neglected cases. It is a unique opportunity for me to use my special skills of deformity correction to help the children who need it the most. It puts in perspective what we do every day and what we complain about all the time. These families and these children, the Haitian people as a whole are such patient, undemanding and appreciative people. They have no expectations and therefore perhaps they have no disappointments. They accept graciously what is offered and live with the hand that life deals to them. What a thrill on Sunday to leave the hospital and look at these straight legs of a handful of patients that will now live a better life but for our short visit here. When I went to the hotel after midnight, tired, spent and barely able to eat my dinner I realize that I felt remunerated in a way without money, without a word of thanks, without any visible reward. Just the feeling of having improved the life of another in an almost incognito way. The gift of giving anonymously. If you have never experienced this, I highly recommend it. It overcomes your fatigue, and all your other senses, and no one can take it away from you. In Judaism it is part of what is called Tikun Olam (Fixing the World). It is believed that if there is enough Tikun Olam the Messiah will return sooner. While I don’t know about the latter I can vouch that Tikun Olam is probably what motivates me in all this. Imagine the world we would live in if there was more Tikun Olam. I will write more about the past two days when I get another break. It is 8:30 AM. Two patients are already waiting for surgery. One is a one year old with Congenital Pseudarthrosis of the Tibia. A rare condition that I have the largest personal experience in the world in treating. A condition in which a child’s lower leg (tibia) breaks and fails to ever heal. I have treated over 90 of these and have never failed to get one to heal. The other is a boy with a bone defect from a tibial fracture from last years’ earthquake. He is missing 4 inches (10cm) of bone. Today we will hopefully solve his problem once and for all. We enjoyed a good night’s rest and started our day with a short walk to the hospital. We passed many street vendors selling everything from chewing gum to diapers to fresh boiled eggs. As we arrived at the hospital, patients were waiting for us and the chance to see Dr. Paley. It is heart breaking to see some of these patients with the problems they have, knowing that if they were born in the USA, their conditions would never have progressed to the level it is. 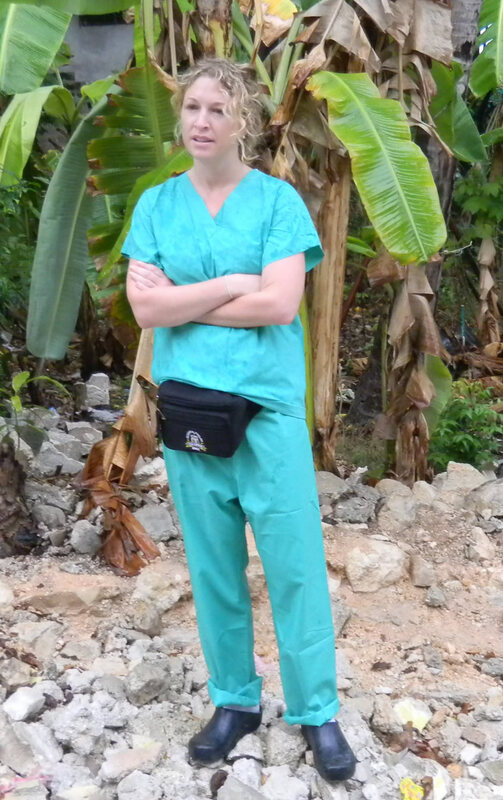 Here in Haiti, the hospital staff is limited, so each team member has pitched in to do whatever is necessary to insure all the cases of the day flow smoothly. One little girl stole my heart. I was asked to transport or literally carry a young six year old girl named Lauri into the operating room. She was scared and crying as I picked her up in my arms to take her back for surgery. There was a short delay before her case started that allowed me to bond with her. She kept repeating to me “chic o let, chic o let,” but I didn’t not understand what she wanted. When I was able, I asked the translator what it meant, he told me that she wanted gum. I would have given her a suitcase full of gum if I could have. The team performed as a well oiled machine today in spite of the difficult challenges we faced today. We were unable to repair theC-arm even with the diligent efforts of Dr. Nelson and Dr. Deitrich. John and Servando each filled in as scrub techs to assist Dr. Paley and Dr. Fougere. Mark did an incredible job which included wrapping a beautiful, post surgical, hot pink cast for a visiting Opthalmologist who tore his achilles tendon. Aviva Paley won the hearts of many Haitian children today as she visited them in clinic and gave them peel off animal stickers. There were many smiles on the faces of young children today. She also organized all the sutures in the O.R. to make them easier to be pulled for the surgeons. As I write this at 12:00 midnight, the team is still in surgery with the Blounts case Dr. Paley mentioned in yesterday’s post. Dr. Paley, Dr. Fougere and Dr. Nelson, John Servando and Mark are all still working. Clinical updates to follow tomorrow………..
We took the short flight from FL to PauP at 6:10 AM. By 11AM we were already in the hospital. The one hour car ride from the airport to Carrefour revealed many remaining tent cities but far fewer than a year ago. A year ago there were even tents in the median strip dividing the highway while this year they are gone. The presence of the UN is much more noticeable. Armed UN soldiers are seen at the market, the stadium, and along the roads. The hustle and bustle of business, markets, and every day life is seen now but was absent a year ago. The wreckage of houses is still very evident, although the rubble is off the streets. The government buildings remain collapsed. Despite this there is evidence of reconstruction of some houses, but much less than I expected. 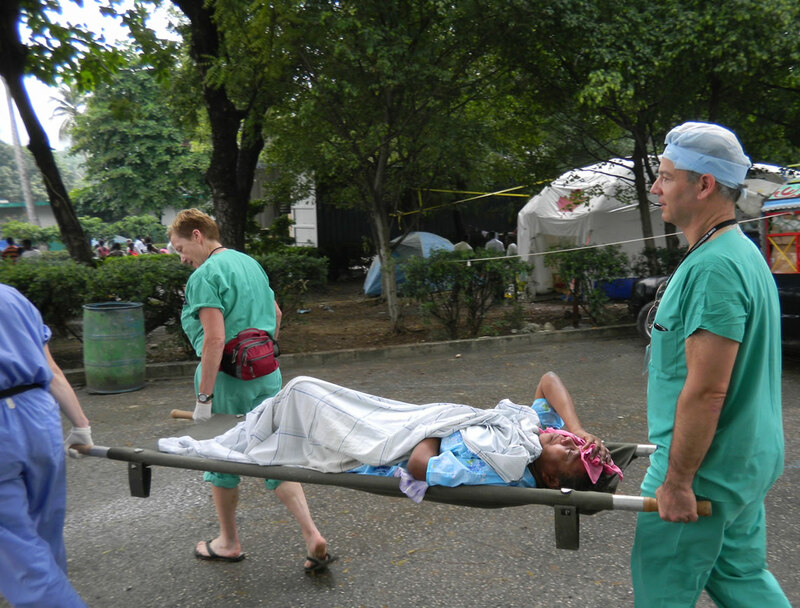 The hospital grounds were devoid of tents and the hospital seemed much more organized. It was difficult to assess because today is the Adventist Sabbath so little but prayer was going on. We were met by Amy and Nathan the administrative couple running the hospital. Dr. Terry Deitrich is the orthopedic surgeon in charge. He has been here since November. 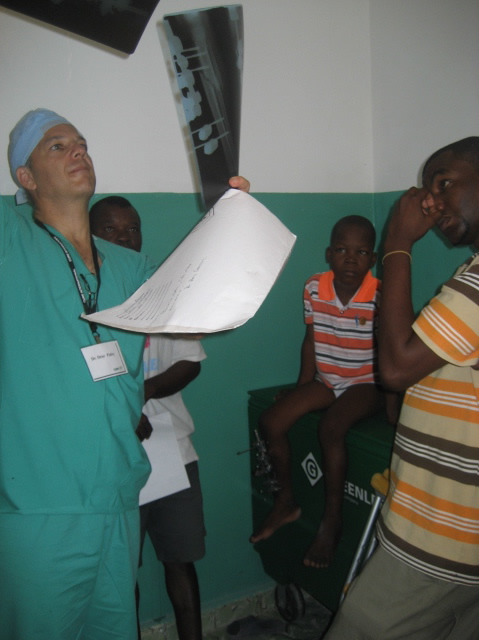 He is an orthopedic surgeon previously practicing in Wisconsin with a long background of missionary medical work. 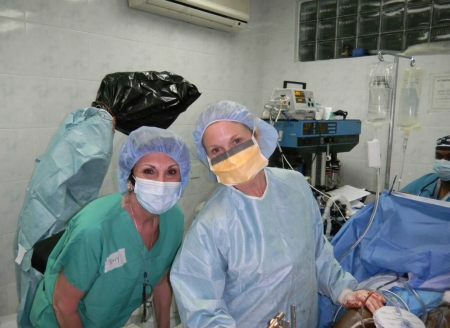 Previously working in the Dominican Republic, Terry is the surgeon who inspired Scott Nelson (my former fellow and our last year’s host) to volunteer and work there for the past 5 years. Terry and his wife Jeannie are planning to be here till November. Under the concept that we brought an expertise there that was not usually available, the Adventist doctors felt justified for us to start operating today (just as it is justified to pull an ox out of the mud on the Sabbath). We reviewed 5 patients with a variety of complex pathology before lunch in order to plan for which surgeries to do today. 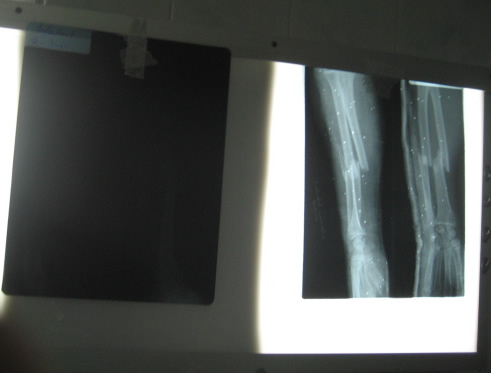 One girl had an untreated severe bowlegged deformity (see pictures) from Blount’s disease. Another had an untreated clubfoot deformity at the age of 17. Another girl had an untreated complex deformity called posteromedial bowing of the tibia with a lot of shortening of the leg. Another boy had a chronic bone infection. One girl had a residual deformity from a crush injury from last years earthquake and finally one girl had nutritional rickets with bone deformities. Terry told me that about 1 in 5 patients currently being treated has residual of earthquake trauma. We began operating around 2PM. We completed the bone infection case. There were two areas of infection and I had to remove a huge amount of the tibia to get them out. I believe we cured him. 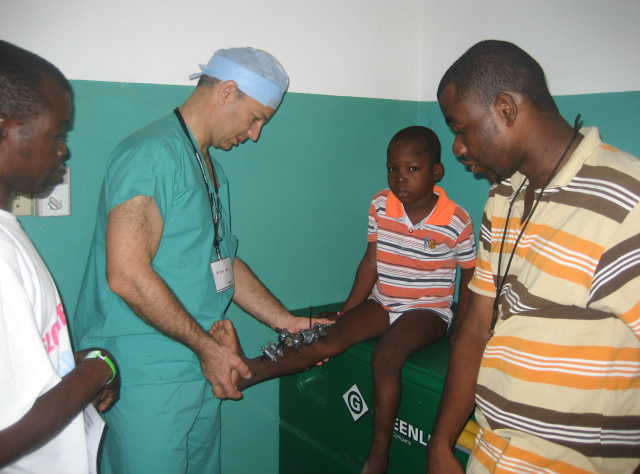 The untreated clubfoot was treated by applying a TSF device. We used a double level device for this very complex correction. Our Smith and Nephew rep brought a lot of the supplies we used and the rest was already here. Dr. Ann Marie James did all the anesthesia today. She did an amazing job. 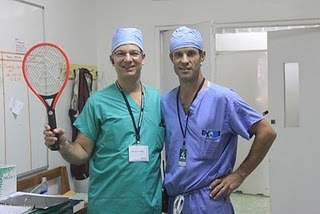 Servando, John, Mark and our fellow Chris Fougere all participated in various parts of these surgeries today. We were assisted also by Ben a resident from Loma Linda and by Dr. Nelson who arrived this afternoon. Finally in addition to our own Smith and Nephew rep Tom, Jeff an Orthofix rep from California was also here to help us. Great team and great teamwork. 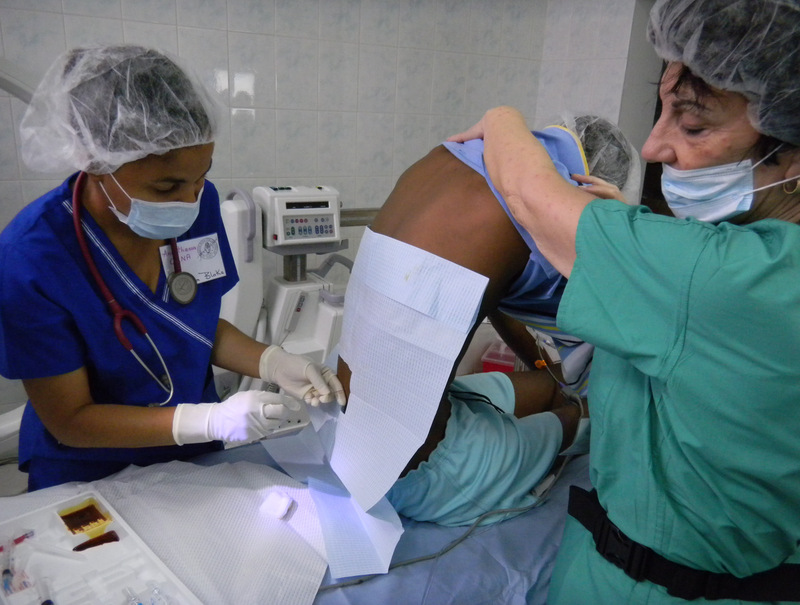 We were also assisted by two Dominican staff that had helped Dr. Nelson when he worked there. One in anesthesia and one a scrub nurse. 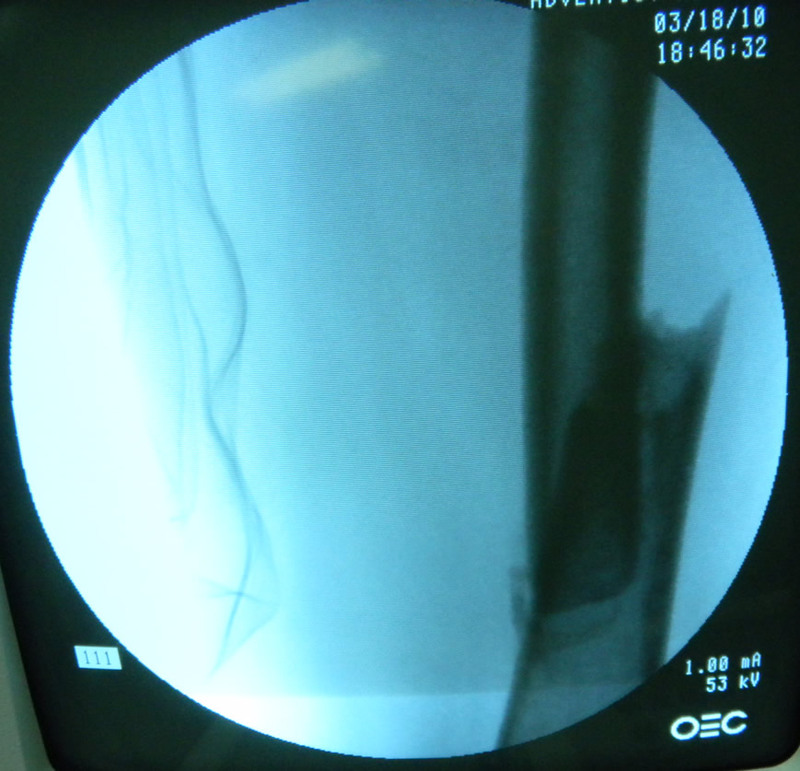 One challenge was that the C-arm (the image intensifier was broken; Dr. Nelson hopes to have it fixed by tomorrow; he brought special parts and was soddering them in place during the surgery). The two surgeries we did today were done without help from xray. Real third world surgery. Overall a rewarding day full of teamwork and camaraderie. Great pathology to see and treat and a sense of doing something worthwhile. Amazing that these peaceful undemanding people live with these horrible debilitating deformities and never complain. What a reward to be able to help a few of them. I am now sitting in my comfortable living room one week after leaving Haiti. I returned to work the day after we got back (March 22) and have had a very busy week. I had little time to reflect on the experience since Monday. Today being the Sabbath again I have taken the time to relax, clear my mind and think. 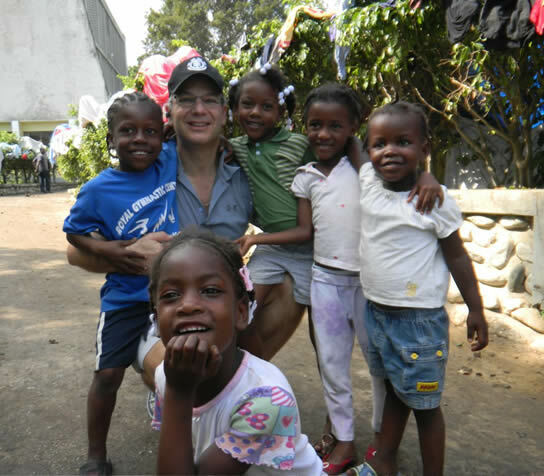 As an epilogue to this trip to Haiti I would like to share my thoughts with you as I close this blog. Haiti is and was a poor country earthquake notwithstanding. It has had a tragic history related to colonialization by the Spanish, French and by the Americans. It became the first independent black nation following a slave revolt against the French. It was the second independent nation in the Americas following the USA. Also similar to us it faced the threat of reoccupation by its overthrown colonial power. While we fought the war of 1812 to finally throw off the threat of reoccupation by Britain, Haiti a much smaller nation had to pay tribute to the French for their losses of sugar export revenue. A major part of Haiti’s GNP went to pay off this debt until the US bought this debt from the French. It was not until WW2 when this debt was finally forgiven. Misrule by the Duvalier’s followed by corrupt rule in the name of democracy by Aristide have bankrupt this nation into modern times. The result is a country that has few exports and needs to import nearly everything including sugar. This is a country that has had no investment into its infrastructure and where the majority of wealth is owned by very few. Despite its longstanding poverty these people had a roof over their heads and had learned to live with very little except for shelter and basic food. The earthquake took even these away. This earthquake killed more people than any other quake in modern history. It displaced more people than any other quake. The immediate and early response of the entire world was amazing and for two months Haiti was the top item in the news. Volunteers and aid of unprecedented volumes poured in to help the situation. Free medical care was established for a population that had no socialized medical care. The acute medical problems were dealt with using modern medical equipment by well trained clinicians. Where are we now after all this outpouring of good will. Hundreds of thousands of people who had a hard roof over their heads now live in nylon tents or under plastic tarps in what can best be described as tent cities. These tent cities can be seen covering any open fields, parks or ground. Even the grassy area on divided roads is covered by tents. The rubble is off the streets but little new construction is apparent. Previously there were volunteers stepping on each other while now there are not enough. Previously it was in the news nonstop while now there are few stories on Haiti. Questions are arising as to whether the aid is getting to where it belongs. I have been asked so many times since I came back whether the situation in Haiti is improving. My answer is that it is actually getting worse. How could that be? The rainy season followed by the hurricane season is beginning. The tent cities with their limited sanitation and their close quarters are not going away. They are at risk for epidemics of cholera, malaria, dengue, typhoid, etc that would replace the wards of orthopedic patients with medically sick patients. If this happens the death toll will skyrocket and threatens to double the casualties of the earthquake. On the last day in Haiti, we took a tour of the city for several hours. We started by walking up the street from the hospital to the Adventist University. The campus is now a tent city. As we walked the grounds of the University dozens of children ran up to us and interacted with us. All with smiles on their faces. Singing could be heard from a church service that was going on nearby. A well dressed man started calling for the children to come to a children’s service and educational session. We followed the children and observed an outdoor one room schoolhouse teaching session. The teacher taught them stories and how to read. Under an adjacent tarp the high pitched voices of younger children could be heard as they sang church songs. I talked to the well dressed many who told me that most of these children were homeless and parentless. He asked me how we could help. I told him we were helping at the hospital. He asked me how we could help here in the tent city. I did not know what to answer. I decided that the only effective way I could help was advocacy when I got home. The Haiti disaster is not over. Haiti has been a disaster for a century but now it is an apocalypse. I have travelled all over the world. I have been to India ten times and to Pakistan once. I have travelled through the Fabellas (slums) of Rio and Sao Paolo, Brazil. I have seen the poverty in Peru and Ecuador. I have travelled to the townships in South Africa and through villages of Zimbabwe. I have been in the West Bank and Gaza and in the impoverished areas of Egypt. I have never seen as hopeless a situation as I saw in Haiti. I came with great visions of helping the situation by my actions. I left feeling I did little despite having worked nonstop for seven days. 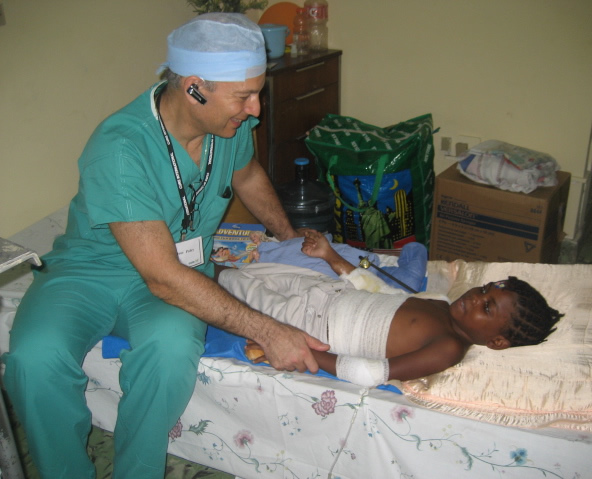 My team did 30 surgeries and treated about 300 patients over the course of six days. We hit the ground running and started operating one hour after we arrived a the hospital and then daily to and including Saturday until 10 at night before we left the next morning. We helped a few people. We left behind thousands more that need medical help and hundreds of thousands more that needs socio-economic help. I thought I would feel accomplished when I returned. I thought I would feel good that I had done something instead of staying home and earning more income. I thought I would make a difference. Instead I feel defeated. Instead I feel I have not done enough. Instead I feel perhaps I went for the wrong reasons. I do however feel a glimmer of hope. I realize that if every volunteer going there feels the way I do when they return they will recruit two more to go back. Haiti needs volunteers not just money. What can you do to help? Each and every person can help in one way or another. My ex wife Wendy who has spent her life volunteering for different causes told me that she wished she had a skill like I did so she could help in Haiti. I took this at face value until my experience at Hopital Adventiste. Every morning and every evening at the group meeting I got to meet the various volunteers that made that hospital run. Aside from the expected nurses and doctors and other medical personnel, here were administrators, plumbers, electricians, architects, computer specialists, hairdressers, mechanics, accountants, lawyers, housewives, personal trainers, life coaches, chefs and many other professions. There were so many people that got involved through church and synagogue groups, community groups etc. All of our food was being cooked for us by a volunteer vegan group related to a following of ‘the Grand Master’. My daughter a freshman in college was trained by us to be an instrument specialist in the operating room. The only qualifications for helping in Haiti are goodwill, selflessness and willingness to help. One needs to be willing to forego creature comforts for the duration of ones stay. The personal rewards in terms of a sense of well being for what one has done are all you can expect in return. There is a golden opportunity for us to rebuild Haiti, a country on the doorstep of the US, a country that has had a relationship with us for nearly 200 years and which has been occupied and dominated by us for the past century. Haitian Americans are a productive important minority in this country. They add to the flavor our multiculturalism with their Creole language and cooking and many of their traditions. They are a wonderful, kind and gentle people. I enjoyed getting to know them and look forward to my next trip back. We have set up a 501c3 that is pending final approval in the next month. It is called the Paley Save-the-Limb Foundation. 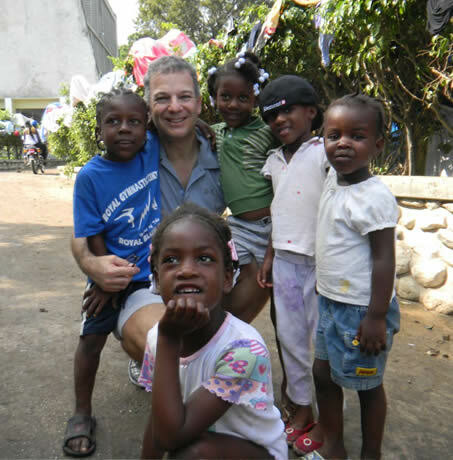 A major mission of our fundraising will be to sponsor future volunteer missions to Haiti. More pictures will be posted in the next day or so. I feel very privileged to have come here with my amazing team. Most surgeons are coming here come alone. I came with a team that can run the entire ortho department and is very self sufficient. Dr. Scott Nelson, our host, has threatened to kidnap the team when I leave. This environment has brought out the best in all my team. It has made all of us be ‘all that we can be’. Back home PAs, Ortho techs, etc are much more limited in what they are allowed to do. Here however there is no one to do all that is needed. Mark Smith our ortho-tech runs the ortho clinic all day long taking off and putting on casts, removing fixators in clinic, making special splints for contractures, and triaging cases to the PAs, Dr. Nelson or myself. Mark has made all our lives manageable here by looking after so much that would have taken our time away from surgery. I was so impressed at how well Mark worked independently. 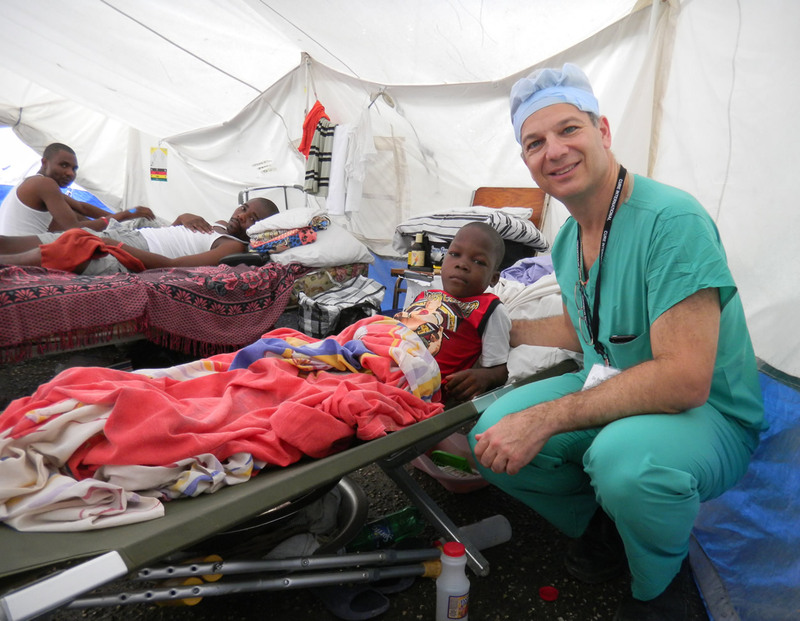 Despite the language barrier Mark managed to communicate through his warmth and caring to all the patients. Mark was so reliable that all the nursing staff knew him by name and called him first for all the clinic cases. Servando Gutierrez who is a physician’s assistant spent his time staffing the orthopedic consults in the Emergency Room and Ortho Clinic, doing rounds on postop patients in the hospital and in the outside tents and helping in the operating room. 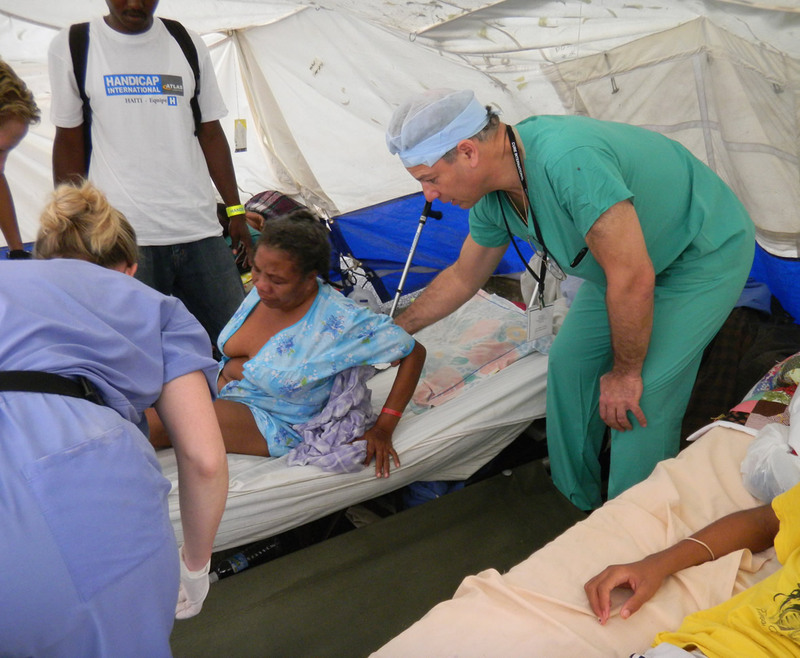 Because of Servando and Mark we were able to see 50 patients a day as well as operate from 8AM till 9PM. Normally, Dr. Nelson would have to do all of this work himself. While our staff was here they took over the running of the clinic and ER and allowed Dr. Nelson to operate more and do many of his other functions in running the orthopedic department. Servando and Mark were challenged by seeing patients with residual fracture problems from the earthquake to dealing with problems we never see at home such as Tuberculosis related ulcers of the limbs, elephantiasis, gout, and many other problems. When a patient came in with a congenital femoral deficiency while we were here it was a welcome respite for our diagnostically challenged brains. Servando, as at home, made rounds earlier than anyone and could be found at night checking up on all the postop patients while the rest of us were already in bed. 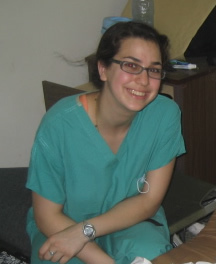 Jennifer Pinsky who is a physician assistant also assisted in the clinic every day. Her main job however was in the operating room. Jennifer first assisted me on most of my cases while Servando first assisted Dr. Nelson on his cases. 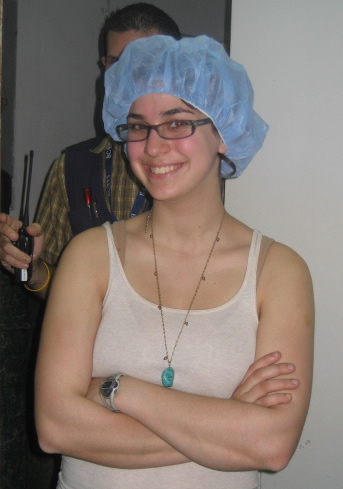 Jennifer also acted as a radiation technologist running the image intensifier fluroscopy machine. When we lost our scrub tech Angela (who had to go back to the DR) Jennifer doubled as the scrub tech and helped organize the cases. Jennifer prepared every case for surgery, brought the patient into the room, and got them positioned and prepped and draped. She also closed every incision on the cases she was scrubbed on. I don’t know how we would have done the surgeries we did without her. Terry Dinovi, an operating room nurse prepared for every surgery, helped the anesthesiologist, got all the instrumentation ready and circulated every case. Terry never stopped all day, and due to her diligence we were able to do a huge number of surgeries. The team work between Terry, Jennifer, Mark and Servando is what made everything hum. I never heard the word no, or I cant do this, or this is not my job, etc. everyone worked incredibly hard for very long hours. There was no job beneath any of us. Aviva Paley, my daughter who is finishing her freshman year at the Maryland Institute College of Art in Baltimore volunteered on this trip during her spring break from College. Aviva spent time as a play and art therapist for the children and adults giving them coloring books, soap bubble bottles, beads to build necklaces etc. This experience has been such an eye opening one to us all but especially to Aviva at her stage of life. 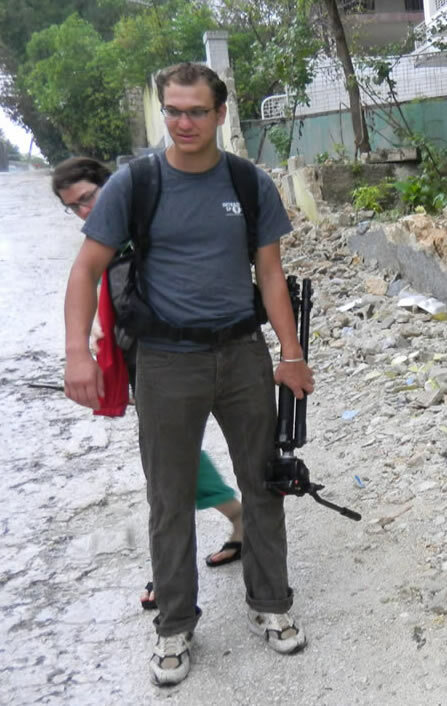 Jonathan Paley, my son came on this trip to film a documentary in support of CURE International and the Adventist Hospital. This film will be used to raise awareness and for fundraising for this hospital. Finally, let me comment on our host Dr. Scott Nelson. I have known Scott for many years. He worked with me in Baltimore as a fellow for a few months. Scott is from California and for the past 3 years has worked in Santo Domingo as an orthopedic surgeon in a hospital run by CURE the organization under whose name we are here. Scott and his family are Adventists and came to the DR on a mission for the past three years. 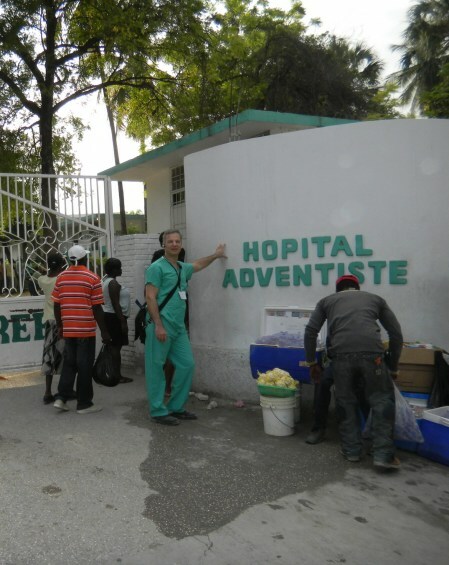 Two days after the earthquake Scott arrived in Port au Prince and began operating. He has been here ever since. What we are doing for 6 days is his life for six months. Scott was planning on returning to work at Loma Linda University. He has delayed his return in order to help set up a system here that will continue after his departure. Due to his efforts the hospital has an administration from Loma Linda which works with Dr. Arshay the Haitian medical director here. Due to Scott’s efforts there is orthopedic equipment of all sorts from plates to nails to external fixators to insturments. Due to his efforts these materials are organized in the storage room here. Due to his efforts there is now an xray machine and an image intensifier machine. The set up allows almost all types of orthopedic surgery to be performed. I don’t know how Scott does it. We are all exhausted from one week of the schedule here. He does this day in and day out. Scot is truly a remarkable person. If all of us had a bit of what makes Scott tick the world would be a better place. Scott exemplifies what in Judaism is called ‘Tikun Olam’ (fixing the world). Orthodox Judaism believe that if there is enough Tikun Olam the messiah will come. Most religions have similar concepts. I have incredible admiration for Scott and what he has done. The entire team has found it an honor to work together with Scott. Keith Dowell is a general surgeon who retired a year ago and spends some of his free time doing volunteer work in developing countries. Keith was on the same flight as us and has participated as part of our team. He assists us in surgery and in the clinic and will do any job assigned. 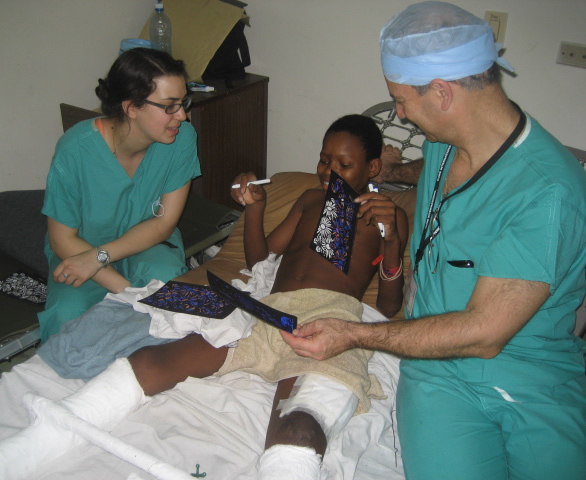 While he has not done much orthopedics before, his general surgical skills offer us an expert pair of hands and a tire Keith Dowell is a general surgeon who retired a year ago and spends some of his free time doing volunteer work in developing countries. Keith was on the same flight as us and has participated as part of our team. He assists us in surgery and in the clinic and will do any job assigned. While he has not done much orthopedics before, his general surgical skills offer us an expert pair of hands and a tireless work ethic. His presence this week has been much appreciated and his easy going personality and team player approach to life made him easy to adopt as part of our team. Andrew Haglund is the Commander in charge of the administration of the hospital. Andrew a professor at the School of Public Health at Loma Linda dropped all that he was doing to come out here and take on the mission of putting this hospital in order to meet the new challenges presented by the earthquake disaster. Andrew a good friend of Scott’s was called by Scott to come out here and help him. What he has done in his short tenure is nothing short of a miracle. We could not have accomplished nearly as much if the environment of security, hygiene, supply, maintenance, facilities etc was not running as it is. With almost a militaristic take over and a discipline needed for this crisis Andrew transformed this sleepy, understaffed underproductive underfunded undersupplied hospital to the premier health providing institution in Port au Prince today. He is leaving to go back to teach the spring semester at the end of the month. His legacy is safe in that he has put in motion an organization that will continue to function according to the guidelines and mechanisms he has organized. His presence this week has been much appreciated and his easy going personality and team player approach to life made him easy to adopt as part of our team. We could not have accomplished nearly as much if the environment of security, hygiene, supply, maintenance, facilities etc was not running as it is. With almost a militaristic take over and a discipline needed for this crisis Andrew transformed this sleepy, understaffed underproductive underfunded undersupplied hospital to the premier health providing institution in Port au Prince today. He is leaving to go back to teach the spring semester at the end of the month. His legacy is safe in that he has put in motion an organization that will continue to function according to the guidelines and mechanisms he has organized. Volunteers man every department of this hospital. We are but a handful of the entire machinery that make this hospital function. They come from all over the US and the world speaking a multitude of languages. It has been wonderful for me as a polyglot to converse in French, English, Italian and Spanish on a constant basis. We owe a great tribute to this revolving door army of volunteers and we hope they will not stop coming even when the acute crisis is over. I know that my team is committed to return next year. Finally to the Hatian staff of doctors, nurses, etc. These are the backbone of this hospital. They are the future of this city and country. All of our efforts will only succeed in the long run if we continue to support and educate the Hatian medical establishment. They are wonderful people whose language creole is French with smile at the end of each word. They are humble and grateful, yet capable and willing. This visit has been a bridge building one between our team and them. They are perhaps the only ones we will see on our next visit here. To Dr. Arshay the medical director (obstetrician) and his staff we owe a great deal of gratitude for hosting us in a most gracious and appreciative manner. Tomorrow, the Sabbath for Adventists and Jews, we will only do emergency surgery. We are scheduled to go for a tour of the city to see the destruction and perhaps some of the reconstruction efforts. We are excited but leery for this experience. The time spent here has brought a lot of tears to our eyes and sadness for these people to our hearts. Despite this all we have seen is smiles on their faces and such appreciation. While we may feel sad they are hopeful. This is definitely a country of people whose cups are half full and not half empty. As we begin to think of going home I am reminded of how good we have it. This trip put it all in perspective. It is so easy to lose that perspective in the land of milk and honey (USA). We will all be coming home much more appreciative for all of our blessings, thinking of how much we have rather than how much we don’t have or want. I for one am so appreciative for the team of skilled, caring, supportive staff that surrounds me and makes me be able to help so many children and adults around the world. It is now 7:00 PM on Friday night. I have been asked to light Sabbath candles and to give an oration for the Sabbath. What a special time and place for such an event. While on rounds in the tents surrounding the hospital we had an unexpected emergency with a woman who was having severe back and neck pain. She had suffered a previous amputation and was living in the hospital compound and needed urgent medical attention. 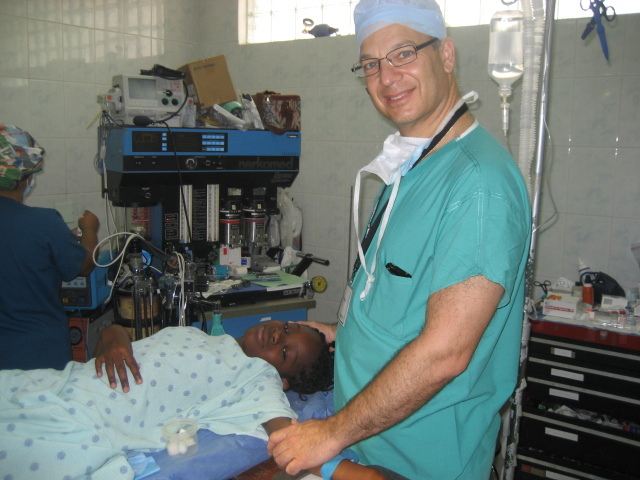 It has been truly a privilege to have Dr. Dror Paley and his team visit our hospital this week. 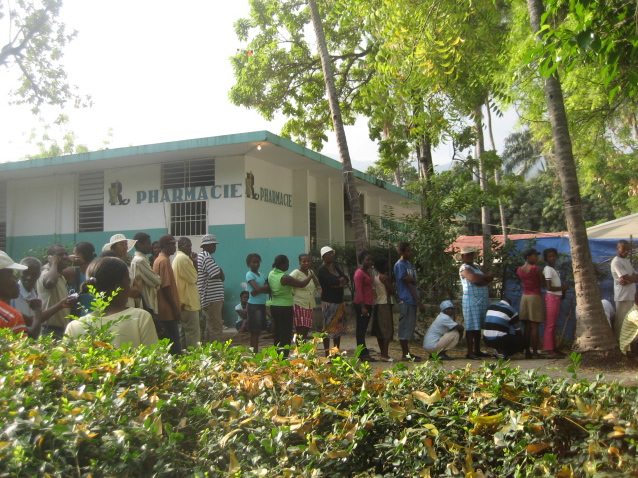 The Haiti relief efforts have been a constantly evolving process. Doctors and nurses have come and gone, injuries have continued to evolve in various ways, and supplies have waxed and waned. Dr. Paley’s visit came at a key time in the chronology of the relief efforts. We are now 9 weeks after the earthquake and the evolution of the injured victims is becoming increasingly complex. There are still people with untreated injuries and many others that were operated on who require secondary procedures. This week we were able to take advantage of Dr. Paley’s expertise in limb reconstruction and trauma surgery in the treatment of these extremely challenging cases. 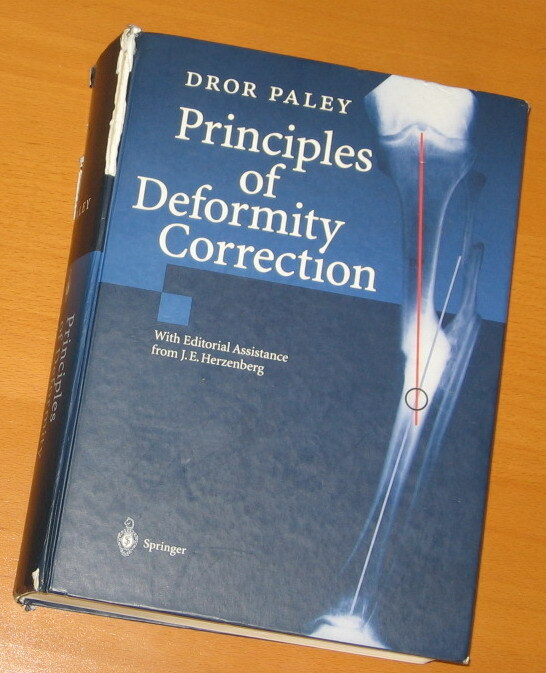 Dr. Paley wrote the authoritative reference on limb deformity correction and is recognized worldwide for his pioneering in these concepts. I have been to his course on limb deformity many times and was also able to spend one summer with him and his partners in Baltimore doing a mini fellowship. The concepts learned have revolutionized my thinking and abilities to treat some of the challenging and exotic problems faced in the developing world. His work here this week not only benefited the patients operated but the many that will continue to be treated with the new principles that I always learn from him. I have been threatening to hire a few local hit men to kidnap various members of this team, and I can assure you that the ransom will be very high. Their expertise, hard work and caring attitude has enabled us to provide the loving and quality care that we strive for at Adventist Hospital. When I saw a mother bring her infant child to the clinic with a congenital short femur it was inspiring to see Dr. Paley talk to this mother. She ironically had no idea that she was talking to a world expert who has innovated the most advanced lengthening techniques for treating this rare disorder. 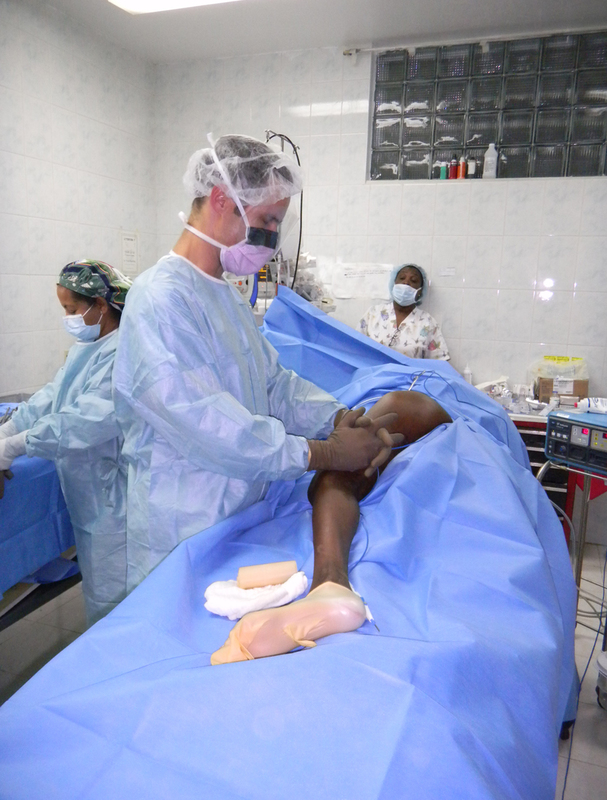 Ultimately Dr. Paley had to ask me what we should do about this problem since the normal infrastructure for providing limb lengthening does not exist in Port au Prince. Without letting the logistical challenges limit our thinking we recorded her contact information, made her a follow up appointment and will make future plans to give her the appropriate treatment. Dr. Paley’s Jewish heritage convened well with the Adventist observation of a Sabbath rest. After a busy and rigorous week of work it was much welcomed by all. Dr. Paley and his children Jonathan and Aviva led out in a ceremonial Sabbath blessing on Friday night to remind us of this special time. Because restoration of life is always a priority in the work God has given us we still have some urgent operations to do today, but feel refreshed and blessed as we conclude another week at Hopital Adventiste d’Haiti. 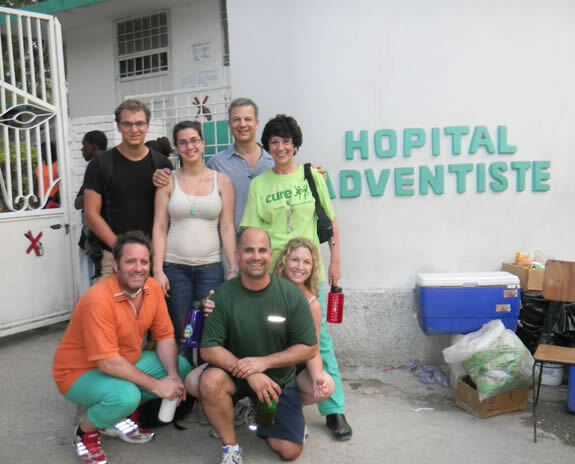 Special thank you to CURE International for providing the logistics and support for these surgical teams and other volunteers helping at the Adventist Hospital that enable top quality reconstructive surgery options for victims of the Haiti earthquake. Today, I was asked to see a 6 year old girl who this past Sunday stopped walking and using one of her arms. She also had some seizures. She is paralyzed on one side. She probably has a brain tumor. There is no neurosurgeon at this hospital. I was instructed to advise the family that they need to search around the city for a neurosurgeon and to get a CT scan. We cannot offer her either of these services and we don’t know where she can go. This is the sad reality of this country. This experience has also taught me how spoiled we are. We complain back home if some instrument is late or is missing. Here we expect nothing and are thrilled every time there is something we need for the surgery or clinic. This venue forces us to be resourceful and to achieve a lot with a little. I have operated all over the world including in India, Zimbabwe and many other developing world countries. This experience has taught me more about how to be resourceful than all the others.